Finally! I’ve being crying for this feature for far too long. No more uploading files to drive first, then copy/pasting the link to task details or comments. Now you can easily upload files to Google Drive directly from Yanado, and easily attach them to tasks. From now on, your teammates will be able to see those files as well. 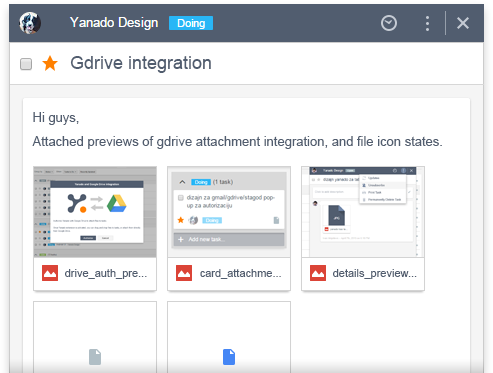 The seamless integration between Yanado and Google Drive allows you to attach a file and then edit it in Google Docs, thus making it possible for the new version to be automatically visible in Yanado tasks. It wasn’t easy to implement this and that’s why it took us a bit more time than expected. We tested it thoroughly, but since there are so many edge cases, please help us out and let us know if you find any bugs or anomalies. There’s isn’t much to write about this, so check out this short video (1min) below to see it in action.